At first I was grumbling under my breath--I had gained 0.4 pounds after having had six days in a row of weight loss. I have this piece of scrap paper on my desk that I record the daily weigh-ins, and there it was slapping me upside the face, as if to say "Why did you have those chips last night?" Then I thought to myself, "What happened last Sunday? And the Sunday before that?" Sure enough, after treating myself to something scrumptious on Saturday evening, my Sunday weight has gone up every single time. I laughed out loud, practising instant forgiveness, because you know what? Those chips were worth it! While savouring every flavour of the multi-grain french onion nachos I was watching The Reader, the 2008 film starring Ralph Fiennes and the incredible Kate Winslet, who has not only grown up since she enchanted the world in Titanic (1997), she has also blossomed into a drop-dead amazing actress. 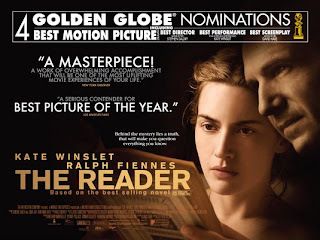 I'm not really sure what I expected with The Reader, but I can promise you that it took my breath away on more than one occasion -- a similar experience to watching The Bridges of Madison County (1995) a couple of months ago. It is the story of a 15 year old German boy who falls into a summer affair with an older woman, a streetcar attendant who we later learn was an SS guard during WWII. I won't give much more than that away except to say that the moral dilemma the boy faces as a man would shake the most stoic to their core. Kate Winslet won the Academy Award for her performance. She was absolutely mesmerizing.